Ruling Awami League-backed lawyers on Tuesday issued a two-day ultimatum to Chief Justice Surendra Kumar Sinha to step down from his post to avoid movement. The relation between the government and the Chief Justice has turned bitter as the Chief Justice has put some ‘objectionable words’ in the full-text of the 16th amendment verdict. The ruling party said some objectionable words have been put in the full-text of the verdict, undermining Father of the Nation Bangabandhu Sheikh Mujibur Rahman and parliament through the observation. 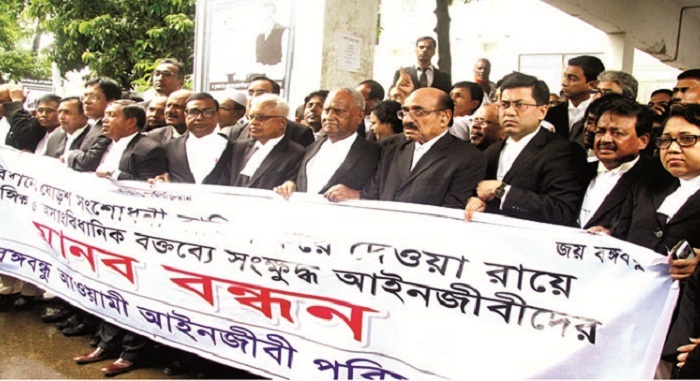 The lawyers under the banner of Bangabandhu Awami Ainjibi Parishad came up with the threat on Tuesday during a human chain programme in front of the Supreme Court Bar Association Building. Parishad’s member secretary Fazle Noor Tapas said the CJ in his observation tried to raise questions over the leadership of Father of the Nation Bangabandhu Sheikh Mujibur Rahman. “He will step down from the chair by August 24 and withdraw the irrelevant observations from the verdict or we will be compelled to wage one-point movement for his resignation,” Tapas said. Tapas, also a ruling party lawmaker, said the CJ undermined parliament and reserved seat lawmakers. “He also mentioned in the verdict that he is not a public servant. He is the only master. We condemn such statements,” he said. The Chief Justice on Sunday cited an example from the Pakistan judiciary. The lawmaker claimed that the CJ showed his ‘red eyes’ to Prime Minister Sheikh Hasina by citing an example from the Pakistan judiciary. “Like in Pakistan, he can remove the premier from the office. Such a threat in the courtroom is unprecedented. It is tantamount to violation of the oath,” he said. The Pakistan Supreme Court recently ousted Prime Minister Nawaz Sharif on corruption ground. The CJ cited the example as the ruling party had been expressing dismay over the SC verdict on the 16th Amendment to the Constitution. The CJ said they had showed enough patience. Referring to the statement, Prime Minister Sheikh Hasina on Monday said her government would no way tolerate country’s comparison with Pakistan. “Everything may be tolerated but the comparison with Pakistan is no way tolerable,” she said. Addressing the human chain programme, Parishad’s convenor Yousuf Hossain Humayun said the CJ should keep in mind that this country is not Pakistan. “It should be kept in mind that Bangladesh is not Pakistan. So, you will not get respite by delivering such words,” he said. AL law affairs secretary SM Rezaul Karim, former justice Munsurul Haque Chowdhury, former home minister Sahara Khatun and SC Bar Association former general secretaries Nurul Islam Sujan and Mamtaz Uddin Ahmed, among others, spoke at the programme.